I must admit that until this post I’ve been reluctant to review fashion jewelry; after all I make gemstone jewelry so why in heaven’s name would I need to go elsewhere for bling. Secondly – I don’t go anywhere. Except to the goat pen and they have been known to munch anything I might have on. But now I AM going somewhere – I’m heading to BlogPaws in May and there will be a banquet on the final night and I want to look spiffy so I thought, “what the heck.” It would save me having to make myself something. Majestical jewelry sent me their Large Leaf Pendant (currently on sale for $17.50) and a pair of complementary earrings (I could not find them on the site). I didn’t know what to expect and I must admit I was very pleasantly surprised. The silvertone feather is quite detailed and has a row of very sparkly crystals running down the center. When they catch light the pendant really comes alive. It falls from a silvertone chain and measures 42″ (with a 3″ extender). It’s a perfect layering necklace as you can see. It’s got a nice bit of weight to it so it hangs well. The earrings are a bit light for my taste and the included rubber backers would be very necessary for someone with long hair as I fear they would get easily tangled and pull out – these are very lightweight. I can easily see myself wearing this necklace with a dress as I’ve shown above or with slacks or even jeans. 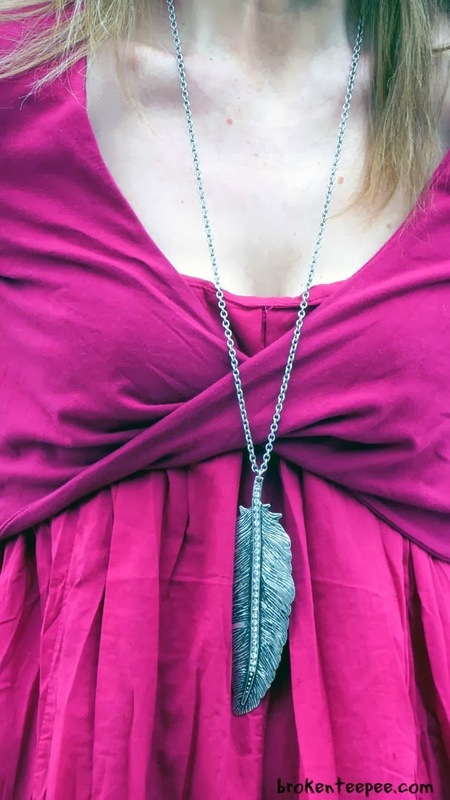 I do love the detail in the feather and the piece is very textural which adds to making it feel like a luxe piece yet it is available for a budget price. 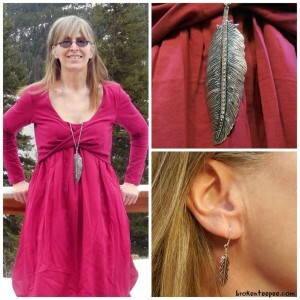 Majestical offers many different styles from fashion jewelry to silver pieces to gemstone jewelry. My piece arrived in a sturdy box which was good as the USPS did not treat it very well. I’m sure you can find something to suit your fashion needs by browsing through all of the pretties that are found on Majestical’s site. These lovelies are available online only and the stock changes regularly so you want to keep checking back to see what’s new. Shipping is free with orders of $49.99+.